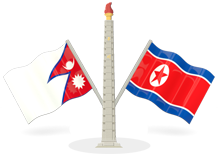 Pyongyang, February 27 (KCNA) -- Kim Jong Un, chairman of the Workers' Party of Korea and chairman of the State Affairs Commission of the Democratic People's Republic of Korea, arrived in Hanoi, the Socialist Republic of Vietnam on Tuesday. Seen at Dong Dang Station to greet Supreme Leader Kim Jong Un were Vo Van Thuong, Politburo member, secretary of the Communist Party of Vietnam Central Committee (CPVCC) and chairman of the CPVCC's Commission for Education and Information, Mai Tien Dung, minister-chairman of the Government Office, Le Hoai Trung, deputy minister of Foreign Affairs, the secretary of the Lang Son Provincial Committee of the CPV and other officials of the Vietnamese party and government. Kim Myong Gil, DPRK ambassador to Vietnam, and members of his embassy were at the station to greet him. The train carrying the Supreme Leader arrived at Dong Dang Station in the border area of Vietnam at 8:15 a.m. local time after passing through several provinces and cities of the People's Republic of China. Kim Jong Un got off the train and exchanged warm greetings with Vietnamese party and government officials. A Vietnamese woman presented him with a bouquet in welcome of his visit to Vietnam. Acknowledging the enthusiastically cheering masses gathered outside the station, he got into his private car and headed for his lodging place Melia Hotel. Along the hundreds of miles-long route between the border station and the lodging place in Hanoi were numberless Vietnamese people of various strata, who waved the national flags of the two countries and bouquets to warmly welcome Kim Jong Un. 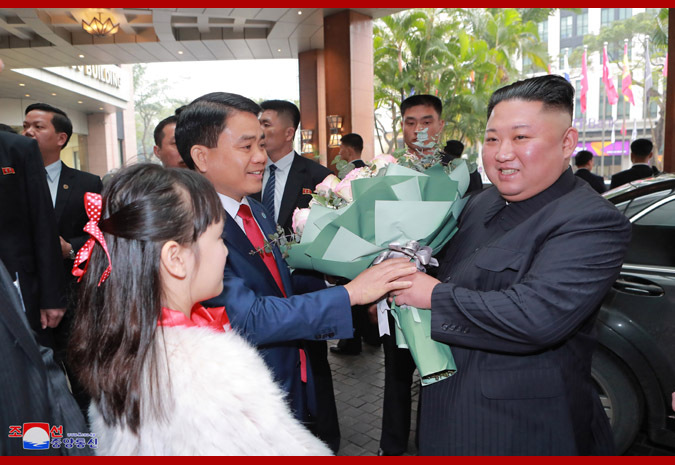 The Supreme Leader was greeted at the lodging place by the chairman of the Hanoi Municipal People's Committee, the permanent deputy director of the CPVCC Office and the deputy-minister of Public Security of Vietnam. The Supreme Leader expressed his gratitude for the cordial hospitality and honorable treatment shown by the Vietnamese party, government and people.